Succeeding with direct mail can be a very complex task. Understanding what makes a mail piece do well (or poorly) can be a bit mysterious. What I've found is that there are MANY aspects of a direct mail campaign that need to be executed flawlessly in order to get a good response rate. One of the most crucial aspects is the message that you are trying to deliver to your recipients. As obvious as this should be – I consistently encounter a lot of cheesy, poorly written and generally thoughtless messages in the ads, letters, and websites that people are using in their attempts to find motivated sellers. Maybe it's a lack of creativity. Maybe these people just don't understand the psychology behind written communication. I'm honestly not sure… but it's hurting them. Will people respond to this kind of message? Some probably will… but not many. Why isn't this kind of message sufficient? Because EVERYBODY else in your market is saying the exact same thing. There is absolutely nothing unique about this kind of mail solicitation. If you want people to take notice of the mail you're sending them, you need to look different. If you want to grab someone's attention, you need to stand out from the crowd. Think about it – when you get a mail solicitation in your mailbox, what kinds of things stand out to you? When you only have a split second to grab your recipient's attention, you need to INSTANTLY show them why you're worth paying attention to and ultimately, you need to move them to action. I'll admit – it's not always naturally intuitive to look different. So how on earth do you do this? I've experimented with a number of different messages and mail formats over the years. After trying dozens of different approaches (some of which succeeded, and some of which FAILED miserably), these are my Top 3 postcard formats that have consistently produced the best results for me. Think about it for a second – if you received a postcard like this in the mail, would you take the time to read it? My theory behind why this postcard has worked so well for me is that it doesn't look like all the other junk mail that people get. The goal with this postcard isn't to be flashy. The goal is to be real. When a mail piece comes blasting out of the gate with “SELL! SELL! SELL!”, people don't pay attention to it because that's what everybody else does. As odd as it may sound, being down-to-earth is different, and people take notice of that. This postcard takes the approach of “You need ME more than I need you.” This can definitely strike a chord with some people (especially if it's true – and they know it). While this postcard has been slightly less effective than Template #1 in my rounds of testing (for reasons I can't completely pinpoint), it still pulls in a lot of responses for me on a consistent basis. Obviously, this template instills a sense of urgency and is likely to catch more attention than the generic, “WE BUY HOUSES” message that everybody else can't seem to think outside of. One look and you will see that this is the flashiest postcard I have. The benefit with using this card is partially in the choice of words, partially in the hand-drawn graphics, and also in the fact that it's double-sided (which means we've got two chances to make a first impression). Side one is your big, bold, attention-grabbing statement. Side two is the personal message (a similar approach to Template #1). Well, they work. In terms of “attention-grabbing”, I wouldn't be surprised if they're more powerful than the actual headline and letter on the postcard. These graphics tend to do the trick. It's difficult to know why some mail campaigns do well and others don't. The first time I tackled a direct mail campaign, I had no idea what I was doing. 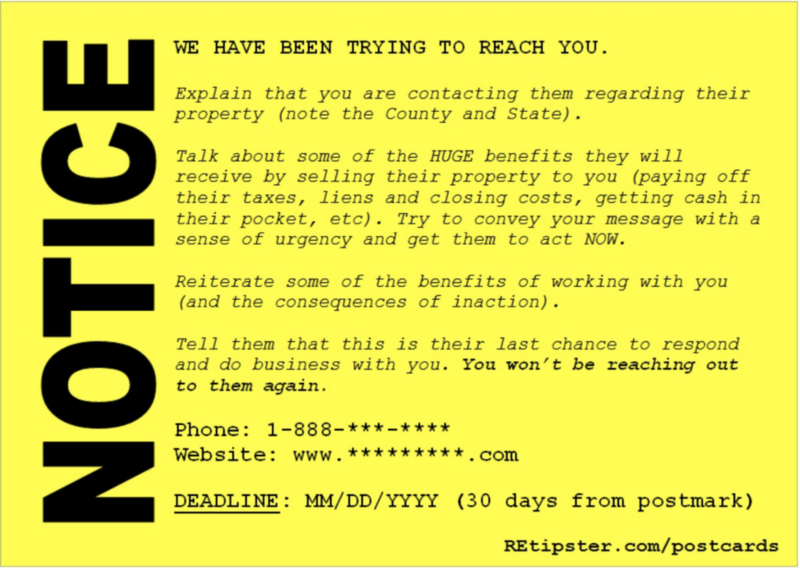 I got a list from a nearby county treasurer's office, threw together a very basic postcard (similar to Template #1) and did a trial run, blasting out 106 postcards via Click2Mail. To my shock, I had a whopping 6% response rate (which, in the eyes of most direct mail marketers, is pretty darn good). Figuring it must have been a fluke, I tried another campaign two weeks later with 300 postcards. My response rate was 14%. After trying this again and again and repeatedly getting a response rate of anywhere from 5% – 18% (and usually in the lower half of that range), I figured I must be onto something. After toying with a lot of different variables and sending out MANY direct mail campaigns since 2008, I've really started to hone in on why some of my efforts produced great results, and why others were far less effective. I'll be completely honest, I don't think anybody really knows all the reasons why some direct mail efforts yield huge results, and why others are deeply disappointing – but there is absolutely some very strong evidence that we can learn from when we analyze our ongoing response rates. My theories above are just that. Theories. I don't know why they work, but they do. My conclusions are based on what I have seen and tried for a number of years. As I mentioned earlier, the message of your mail is only one of many aspects that need to be fine-tuned in your direct mail campaigns. There are other areas (which are probably even more important) that need to be fine-tuned just as well. That being said – this whole process isn't even worth going through if you're not going to pack a solid punch with your message. Remember the importance of looking different. Be real and you won't have any problems standing out from the crowd. Want To Get The Exact Postcards I Use? As you can see, the examples above are meant to show you the format of my postcards, but not the exact wording. I do this because I don't want to dictate what you do with your letters. You may very well be a better writer than me, so I don't want to imply that my postcards are the best letters ever written. On the same coin, I have spent thousands of dollars and years of my life testing, re-testing, and RE-re-testing these templates to come up with the final product that I use today. There is nothing particularly “magical” about the wording I use, I've just invested a lot of my time and resources to refine this type of written communication – to the point where I have a pretty solid grasp on how to get responses out of the right people. …or you can save yourself a lot of time and frustration, and use the exact same templates I do (and just for kicks, I'll throw in a couple of extra bonus templates, eye-catching graphics and a video tutorial to help you along the way as well). Note: When you sign up as an REtipster Email Subscriber, I’ll send you an instant $20 off “Discount Code” for this item, and if you enroll in the REtipster Club, you'll get access to this item for FREE. There's no pressure of course – just want to make sure you're aware. No problem David – check your inbox shortly. Please send me a copy of your postcard! Thank you! Hi Brian – you can get those templates at the bottom of this blog post (see above). Thanks! Seth – Please send me a copy of your postcard. Thanks. Hi Sharon – I’ll email them to your shortly. Thanks. Hey Seth, can you send your postcards to me as well? No problem Jeff, I’ll send them to you today. Hey Seth, I made my way here from BP. I’d like to see your latest and most successful postcards. I’d also be interested in the criteria you use for your lists. Hi Seth, can you please send me the postcards you use? I came from BP as well. Thanks…. Hi Scotty – I’ll send you the templates later today. I’m a BP’er 🙂 Are you able to still send the postcard? Thank you! Thanks for a great article. If you could email the templates I would greatly appreciate it. Again thanks for all the super articles that you are posting. I’m reading all that I can. you don’t take credit cards? Thanks for asking. You actually can use a credit card if you’d like. When you click on the Add To Card button above, click “Checkout with Paypal” on the following page. When it asks you to login to Paypal, just click “Don’t Have A Paypal Account” and you will be given the option to pay via credit card. Let me know if you have any trouble! What exactly is in the post cards? Are they for marking for lands? Do one need to tweak it for houses? How can one use it with click2mail? Hi Abdul, these postcards are usable for either land or houses (or any type of real estate, really). I’ve primarily used them for land deals, but they are worded in such a way that is 100% as applicable to other type of real estate. Thanks for freely sharing so much great information. I’m gonna buy the package and try different combinations. I’ll let you know what worked best. Keep up the good work! Thanks a lot Hichem! I appreciate you checking out the blog and hearing your feedback. Thanks for sharing this was great insight and I will be sure to apply this brilliant communication strategy, I would like to receive some examples of your post cards! Hi George – I just sent you an email. Hi Terry, sorry about that (it should be in the initial Welcome email that comes through). I’ll email it to you shortly. Hi Aaron, that’s awesome! Thanks for checking out the blog. If you sign up for the REtipster Club, you should get that discount code emailed right to you. Great article! How many postcard example are included in the package? Is postcard gear for both sellers and buyers? Hi Mac – there are 5 templates total (including 2 bonus templates). The postcards are geared towards finding motivated sellers (not so much for buyers – though you could probably tweak them a bit to go in that direction if you wanted to). Great and helpful article! Could you send me the templates as well? Mr. Seth, before I order, please send me the exact postcards you’re using to mail to sellers and buyers. Lol – do I really look that gullible Z?? Can you please send me a copy of your postcards? I know it will jump start my direct mail campaign. Thanks! Outstanding content. You have a unique ability to write and teach. Impressive. As you can see from my website, which is being revised, my interest is lease options with which I am very familiar. I can see where your lead development approach will apply here as well. Don’t know exactly how best yet. Thanks for sharing your thoughts Steve – much appreciated! Can you please send me the postcard you are sending? I wholesale and assign properties to investors for a fee. How would you alter the postcard copy in order to convey this to the potential seller? Or would you just use the same postcard to get their attention and then tell them what you are doing later? My name is Arthur and I am sitting here scratching my head as to what to write on my post cards and bandit signs to where I can get the best response. I would love to get the best wording that has given you the best results. Hi Arthur – sigh… do you see that big ADD TO CART button above? You can download it right there. Hi Seth. Im really interested in your mailers. Please email me the discount. Thanks Timi! All you need to do is subscribe to the mailing list and you’ll get the discount code for any/all items that are available to download with a discount. Ive purchased your templates and I am about to send out my first round of mailers. Im going with the personal letter first. I was reading I thought I read a blog you wrote about what to do when the calls start coming in. I cant find that blog anymore. Do you have a script or advice on controlling the conversation and things to say or keep in mind when the potential seller calls? Hi Seth, I’m having trouble using click2mail, customer service is not much help is there a certain file extension software and format you use when uploading to it? Hi Trevor, I always use Microsoft Excel (.xls) files when I’m uploading my lists to Click2Mail. Is that what you’re using too? Still working with it. Yes using excel. Haven’t tried to upload yet. Are you using excel to construct your yellow post cards? If not, how. Will try to use post cards here soon. Hi Trevor – I just use Microsoft Word to create and edit my postcards (as long as you’re using the templates provided on Click2Mail OR my templates above, it should work with their system). I only us Excel to edit my lists and upload them to Click2Mail (more on that here). Hi Seth, I signed in to get your mailer and your discount. Can’t find your mailer should I try and sign in again? Hi Trevor – what exactly do you mean by “mailer”? These postcards aren’t a part of the REtipster Toolbox (but again, I’m not sure if that’s what you’re asking). I signed up on your wed site. Got the email confirmation. Where do I go to get your discount code. I also tried to pay for your postcard templates. It only gives me the pay pal option. Trevor – you should have gotten an email with the subject line “Welcome to the REtipster Club!” – do you see this anywhere in your inbox? The discount code shows up right after the 2nd paragraph of this email. If you still don’t have it, let me know. Don’t see the discount code. It’s only letting me pay with pay pal. PayPal is the merchant and you can use it to pay with a credit card. Just click the “Checkout” button and you will see an option on the next page that says “Pay with a debit or credit card, or PayPal Credit” near the bottom. Click it, and you’ll see where you can enter in your credit card info. Hi Treyvon, you just have to enter your email address into the email opt-in box above (there’s one just below the blog post above, and there’s another one on the right-hand sidebar of the website – near the top). I would like a copy of you book, Investor Hacks. How do I go about doing so? Hi Alexis – that’s great! All you need to do is sign up for my email list (the REtipster Club). There’s an opt-in form at the bottom of every blog post (see above) and in the right side bar of the blog (near the top of this page). 1. In stead of post cards do you have letters for me to purchase? 2. Which one to you is more effective the offer letters or postcard? 1. I don’t use letters for this particular purpose, so I can’t help you there – sorry! 2. For a number of reasons, I think postcards are more effective (I talk more about it in this post). I want to purchase it but do I need a promp code in order to get a discount? Also is this post card is exatctly what you use up to this date to get a response? You can get the discount code by signing up for my email list (it will be sent to you automatically with my “Welcome” email). And yes – this is the exact postcard I use. I’m tempted to buy your postcards, but I’m a really smart guy and I think I know what they say already. I’m going to find a way to use this $29 to buy land instead. I know it can be done. No prob – thanks Stuart. Good luck! So it looks like you don’t actually include a proposed purchase price in the initial postcard. It seems like this would be a good way to weed out sellers you can’t work with. Is this something you’ve tried or do you think it pares down too many of your potential sellers? On one occasion, I did send out offers for $100 to everyone, for every property, regardless of what it was. On the one occasion I tried this, I received zero responses. Admittedly, I probably didn’t test it thoroughly enough to know if it works (and I probably could have done a better job of basing each respective offer on the assessed value, or something to that effect), but generally speaking – I haven’t found this to be the most effective way to handle my offer process. Not to say it doesn’t work… I just like to make offers that are more educated (still ridiculously low, but at least they aren’t completely blind). Sounds pretty solid, I’ll think I’ll give it a shot! Hey Brian – it was actually in 2008, 2009, 2010 & 2011… not really what I would call the “boom” years, but whatever. Getting those kinds of response rates actually has less to do with the postcard template and more to do with the list. More on that here. I am just getting started and would love to see some examples of post card mailers, I need some ideas for something dynamic in a few short sentences. I would appreciate anything you could send. Hi Matt, if you’re just looking for some examples, you can see them laid out in the blog post above. If you’re looking for the exact wording of my postcards, there’s also a purchase link above. Can You send me your actual postcard too! Thank You Seth! Can you send me a copy of postcard used? Hey Mimi, thanks for checking out the blog post! Just so you know – there’s an “add to cart” button right at the bottom of the blog post… not sure if you saw that. Hi Tochukwu. Sorry for the confusion here (I’ve never heard of this issue before). 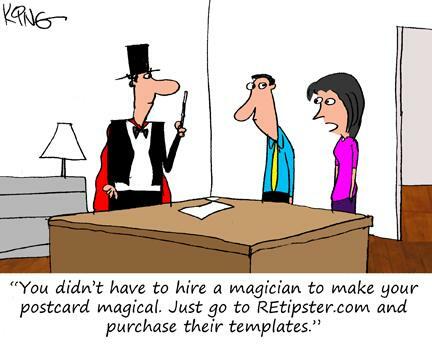 I just emailed you the templates, the discount code, and full access to the REtipster Toolbox. If you need anything else, just let me know. Thanks! Thanks Marco! Glad you’re enjoying them! Hi Tom, great question. I think you’re probably right. I have tried this approach on one occasion… I sent out about 400 letters with laughable offers enclosed in each envelope – and I got a whopping zero responses. That being said… just because I didn’t have success with it, doesn’t mean it isn’t feasible approach. Bad direct mail campaigns can & will happen to everyone eventually, and one try really isn’t enough information to draw a final conclusion. Back when I tried it (a few years ago now) I just knew that I was having success with my alternative approach, and since my approach had proven effective for me – I just reverted back to what was working. I think it’s certainly healthy to try new things, and there isn’t one right way to do this, so if you’ve given this method a try and it’s working for you, then you probably don’t need my advice in this area – stick with what’s working! Oh man – brutal! I actually haven’t tried either method, I’m just trying to figure out how I want to do my first campaign. I’m leaning towards postcards though, because zero responses would shatter my already fragile self-esteem. Yeah man, I hear you. I remember it hurting when I got zero… it can happen, but it’s never a fun experience to endure. My first batch of postcards goes out today! (thanks for the templates and advice in this post). Do you make offers on every property that calls? Or just the ones that seem motivated? Just speaking for myself – I used to make offers on everything back when I first started, but these days, I am MUCH more selective about what I pursue (mainly because my time is significantly more limited). That being said… if you’ve got the time and money and you’re eager to learn, you can certainly increase your response rate (and learning process) significantly by making offers on everything you see. Just be sure to be thorough on your due diligence before you close on the transaction. What about postcards for buyers any verbatim scripts to send potential buyers?I’m trying to build my buyers list. Hi David, GREAT question. I’m actually working on a blog post right now which will cover that subject in great detail. I should have it published sometime in the next month. I will be using these asap! Are you by any chance still sending your postcard templates out?? Hi Cameron, they’re available right at the bottom of this blog post – but they’re not going out for free anymore. Sorry! Thank you very much for your informative blog and article. It’s really helped me. You are such a brilliant writer. If you have your brilliant postcards, is it possible to send me some free. Its okay , if you are not interested. I really do love your article. Please write more and more. We really need this kind of stuff. Thanks Charley! Unfortunately, I’m not handing out these templates for free anymore (I just don’t have the time to send out these files to anyone who asks), but as you probably saw, they are available for sale at the bottom of this blog post. Love the blog. If you could send me the Promo code for your templates I would appreciate it! Hi Dave, I just sent it to you. Thanks! That’s awesome Donald, thanks so much for sharing your experience! That’s very interesting to see the commonalities of what works well in different kinds of businesses. Thanks for your brilliant ideas, you’ve been detailed and a lot of help compared to other sites similar. If you could send me the Promo code for your templates I would appreciate it! Hi Bryan, I just emailed you the discount code. Thanks! Seth, I am a BP member and new to your site! Im a big fan and I truly appreciate you and all your information. Your changing lives! Can you send me a promo code for your template? Hi Sean, thanks for stopping by! I’m pumped that you’re liking the site! I’ll email you the promo code in just a second. Hello Seth your promotional letter templates are awesome. It is a great marketing technique. I would like the opportunity to purchase the post cards at a discount. Hi Josh – I just tried to email you the discount code, but it got kicked back to me. Give me your correct email address and I’ll try again! Hi Seth, I like the idea NOT inventing the wheel. 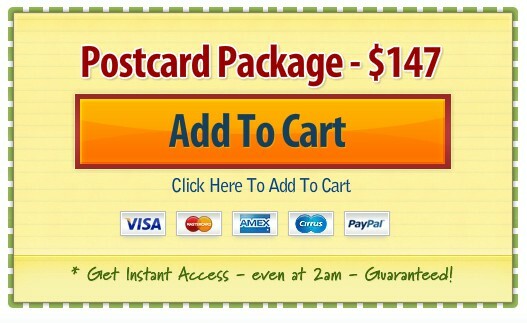 I want to try and spend my $ if your postcard templates has high % respond. Could yous end me the discount code ? Hi Diyan, I haven’t seen what yellowletters has to offer, so I can’t really speak to that with any real knowledge. Have you signed up for REtipster email list? That’s all you need to do in order to get the discount code. If you need any further help with this, just let me know. I’ve signed up but did not received your promo code. Could you email? Thanks. Hi Tri, I saw you purchased this item with the discount – so I’m assuming you got the promo code… but if you still need help here, let me know and I’ll email it to you. Hi William, you just need to sign up for the email list and you’ll get an automatic “Welcome” email that contains the promo code. There’s an opt-in form at the bottom of this blog post (see above). Hey Seth! great templates. Thanks! do you have a voicemail transcription that you have recorded for the sellers to call into? Hi Gabe! If you haven’t seen it yet, you might want to check out this blog post for some ideas/insights on that. Would definitely appreciate seeing what your postcards look like. No problem Harold. Best of luck! I would love to see your actual postcard! That’s awesome Nate! You can feel free to get it through the link above. Glad to hear it Rich! You can get them right at the bottom of this blog post (see above). Great information Seth! I have purchased your templates and am preparing to send out my first batch of postcards. Does purchasing “lists” actually produce viable leads or is it better to go with a geographic area mailing such as Click2Mail’s Every Door Direct Mail in the areas I have scouted? Hi Terry, thanks for your purchase! Hi Roy – you can get them right at the bottom of this blog post (see above). Hi Seth thanks for the advice and I’d love to save me precious time . I’m pumped .. could you send me the discount code to proceed with the check out process . No problem Stanley! I just emailed it to you. I would love the discount code as well! Just out of curiosity, do you at all offer a price or to pay off the delinquent tax on your initial postcard that goes out? Or do you like to chat about the property first then send an offer. Thanks! and my apologies if this was already covered. Hi Joe, have you signed up for the email list? You should get access to the discount code immediately after you sign up. I just received the code thanks! I assume I will find out about the offer question once I order the template! Ah right – as for the offer price, I don’t typically include this in the initial postcard, but in some cases I will offer to pay off their delinquent taxes (whatever they are) as part of the “hook” to get them to call me. This can be a little tricky though – because you don’t necessarily want to advertise on a postcard that they have delinquent taxes. Nevertheless, I include an example of this in one of my templates (the double sided template). You should see it if you get the package. one more question for you and I appreciate your help and feedback tremndously. Very generous of you. On most county websites it says you must not use this tax information for commercial purposes. Have you ran into this? What is your work around? I can’t think of a time I’ve seen that with regard to tax delinquent information – but if I did, I wouldn’t consider my use to be a “commercial purpose “. can you send me a copy of you post card. thanks. Hi Arvin, thanks for your interest! You can download them through the link at the bottom of this blog post (see above). Hi Seth, just bought the post cards. Great content! My first batch was last week and I sent letters. On day 3, I started receiving call backs, after 2 more days, I’m at 4% response rate. Not horrible, but I’m thinking its not that great either. I sent 300 letters, day 3 – 8 calls, day 4 – 4 calls. Does that seem a little low to you? Should I expect more calls in the next week or so? I’m sending out my new batch of letters this week (gonna try post cards soon) and I’ll be including the line from your post cards about recording set up for 24 hours per day. What do you say on your recording? Do you have an option to press “0” to speak to someone live (Answering service)? Loving everything I’m learning! Great work! Hi Melanie – looks like you’ve been successfully subscribed. Thanks! Hi Travis, there are 5 templates included with the package. And yes, I’ve updated them a couple of times since this blog post was first published (mostly just changing the fonts and formatting). Hi Nigel – did you sign up for the email list? The discount code should have been automatically emailed to you. If it never came through, let me know and I’ll get it to you. Hi Nigel – did you sign up for the email list? You should’ve gotten the discount code emailed to you. If it never came through, let me know and I’ll get it to you. I signed up to the email list a while back and I can’t find the discount code. Can you resend it to me? Also, does the discount code apply to the The Complete Package? I just signed up to your email. I would love to use your post card could I get it . Thanks Reggie! I don’t give these away anymore, but you should have gotten a discount code when you signed up… if you want to use it and didn’t see it, let me know and I’ll send it to you. Signed up; can you email me the copies of your post cards! Thanks for signing up Evan! We don’t give these postcards away anymore, as they contain some pretty valuable intellectual property – but you should have received a discount code for them when you signed up. If you didn’t get it, let me know and I’ll send it to you. Hi Darell, I just emailed it to you. Hope it helps! Hi Darell, you should have gotten an email with a link to download them. Did you get this? If not, let me know and I’ll send you the files manually. Hi Seth I received the link to download the templates but I cant open them from my Android phone what should I do? Hi send me your post card please. Hi Ervin, you can get them at the bottom of this blog post (see above). May I please see a copy of your postcard. I will love to do a Win-Win business with you. Thank you. Hi Frank! I appreciate your interest in the postcards, but I don’t give these postcards away. You can get the at the bottom of the blog post (above), and if you need a discount code for them, you can get it by signing up for the email list. Best of luck! New to real estate investment. Looking to purchase postcard package. Hey David! Thanks for asking… but I stopped giving away these templates a couple years ago because I couldn’t keep up with all the requests. You can download them at the bottom of this blog post though (and if you haven’t signed up for the email list yet, be sure to do it – you’ll get a $20 off discount code). Hi seth, love your website and blog im learning alot! Can you please email me ur postcards so i can improve my response rate? Hey Kyle – thanks! I stopped giving away these templates a couple years ago because I couldn’t keep up with all the requests. You can download them at the bottom of this blog post though (and if you haven’t signed up for the email list yet, be sure to do it – you’ll get a $20 off discount code). Seth, what is your opinion on actually submitting an offer on the postcard instead of letter. Let’s say you do a search for 5 acre pieces of land in certain county and than just write: We would like to buy your 5 acre lot. Our offer is $1500 on the postcard. Is there anything wrong with this approach I’m missing Seth? Could it be unethical or illegal? Did you ever try it Seth? I would like to know your opinion. Thank you! Your website is an amazing resource! Hi Milan – check out this blog post, I think you’ll find the insights you’re looking for. I just purchased your templates and had two quick questions. Do you ever add your email to the postcard as well as your #? Also is there a reason you don’t specify that you will pay outstanding property taxes as well as closing costs? Hi Josh, I haven’t ever added my email address, but I know others who have and it seems to work out well for them in some cases (you never know… some people may prefer that method of contact, so it doesn’t hurt to give them the option). Postcard #3 sort of implies that the property taxes will be paid off, and Postcard #2 does say it pretty clearly. Keep in mind, if you want to make it clearer or be more straightforward about what you plan to do – don’t be afraid to change up the wording yourself! Hi Curtis – great question. I’ve used these mostly for contacting delinquent tax owners – but the language isn’t terribly specific about this issue… so if you wanted to send them to other types of motivated sellers, it wouldn’t difficult to use the exact same copy (or make some minor changes to gear it more specifically to another audience). Thank you for the response and also the templates! They have definitely been working with the type of system you recommended to have it automated. Another question for you, how often do you send out these mailers out? Once every 2 weeks, 3 weeks, or month? Thanks Curtis! I’m glad they’re working out for you. As for the frequency – it depends on how many mailers you’re sending out with each campaign and how much deal flow you’re able to deal with. For most people who are working a full time job and only have 5 – 10 hours to spare per week, I wouldn’t recommend doing more than 1,000 per month to start (because if you’re working with the right list and sorting it properly, you’ll be VERY busy). However, if you’ve got plenty of time and/or help, you could do a lot more than that. It’s really up to you! I am interested in purchasing your postcard template. I am also a(n active) real estate agent. Are these templates investor-agent friendly? Hi Lisa – I’ve never done it from that exact perspective… but from what I can see, I think it would work for this. It might require some slight revisions in the wording, but this wouldn’t be hard to do (you could largely keep the same format and copy). I know of one agent in particular who did this and they had some pretty good success with it. Thanks for responding!! Great to know. Thanks for the great information! I just created my first batch of direct mail postcards. Do you think it is a good idea to include branding or logos on the card? Also, do you usually put a return address or do you expect them to primarily contact you by phone or website? Hi Austin, I’ve included my logo one some postcards. It might help, but honestly – I haven’t seen enough evidence to suggest that it makes a big difference either way. I do have my business address listed on the postcard, but people rarely contact me that way. Instead, most people follow the instructions on the postcard, which tells them to contact me via phone or email. Hi Seth, would you mind sending your postcard templates? I’d love to try this out. Hi Philip – I don’t send out these postcards on-demand like this anymore, but if you’re interested, they’re available right at the bottom of this blog post (see above). What file format are your templates in (Word, Power Point, Photoshop, etc.)? Is this something that can also be sent to a print company for mass production? Would this file format work for them? Hi Jenetra – they come in Word format (along with some images you can insert if/where you see fit). I’ve used these countless times with Click2Mail, which is basically a service that does mass mail production… so if you’re using that service (or one like it), I think the answer would be yes. Thanks for asking! Best of luck. Hi Seth I subscribed some time ago,.but I was not ready to start my marketing, hence can’t find my welcome email, can you please email the code for the discount..thank you. Hi Aileen, you bet. I’ll email it to you shortly. Thanks Jim – you’re officially on the list! Hi Seth, how do you measure your return rate? I.e., do you figure the amount of responses every 30 days? 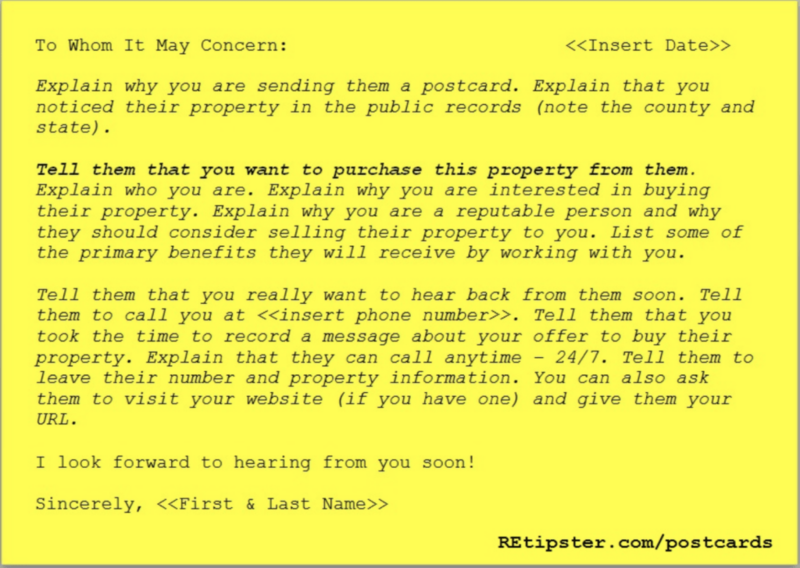 Do you code your postcards and have potential sellers give that to you to track when they call/email/text you? Hi Seth, just following up. Hi Jentara – sorry I missed your earlier comment. I measure it in terms of how many people respond per campaign. Since I only do one county at a time – it’s pretty easy to track. Hi Stefan – you can get them at the bottom of this blog post (see above). Would like to order the Postcard package so looking for the discount. Hi Alfred – I’ll send it to you shortly. What do you find the conversion ratio to be on these three templates? Thanks! I look forward to the discount code. Hi Denis – I just sent you the discount code. The average response rate I get on these postcards is anywhere from 5% – 10%, and I’ve seen it as high as 18% when used on conjunction with the delinquent tax list. that you had the good response rate. Hi Devon! Thanks for checking out this blog post. As you can see above, the postcard templates are available for purchase if you’d like them (if you’d like a discount, be sure to sign up for the email list and you’ll get a discount code for them). Another great post Seth. On your first template, I see that you are including your name as a signature. I’m a little torn on this. In some of your other posts, you mention forming a company, using a PO Box, setting up a new phone number for voice mails, etc. I assume this is to help keep your personal information anonymous (i.e., those angry people that show up to your PO Box looking for you). Given all this, do you still use your actual name on the post cards or are you using the name of your business? Thanks! Thank you for the great postcard template, just purchased and downloaded! 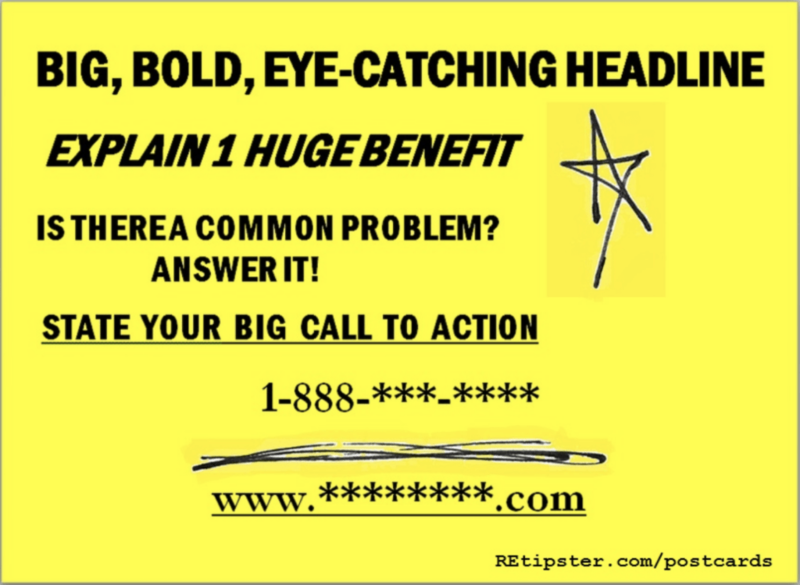 Do you have a script you sell for the call in message mentioned on the postcard? I have my phone number set up and wanted to send a script to fiver and was looking for effective examples – thank you! Hi Seth, I just ordered the package and am wondering if there’s a particular order you send these postcards? I would think you’re not starting out with the Final Notice, but I’m wondering if you recommend sending Personal Letter, then Double Sided, then Final Notice to the same prospects? 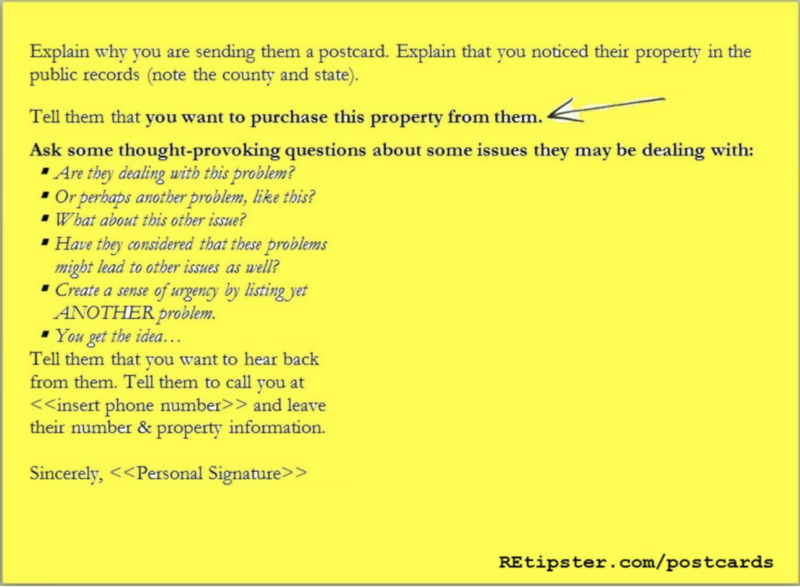 I have a large list of delinquent tax properties, so in your experience, would you expect that I’d get a better response from sending all 3 postcards to the same list of 100 people (with perhaps a week interval between), or would my money be better spent on sending the same postcard to 300 prospects? If the latter, would the Personal Letter likely be the best option? Of course I understand you can’t guarantee any results, just wondering from your personal experience what you think the best approach would be to start with. I was also wondering if you’ve seen a better response from using “To whom it may concern” vs their actual name. Also, for the personal signature, are you just inserting a jpeg of your signature in that space? Hi Miles – great questions! In almost all cases, I follow the “one-and-done” method… I simply choose one of the formats above, send it out, and move onto the next area (I don’t hit them with a timed series of postcards). I do this because with a delinquent tax list (the type of list I work with most of the time), the list changes pretty rapidly, and it doesn’t make the most sense to keep hitting people over and over again after they’ve either lost their property to foreclosure or they’ve already paid off their taxes. I’ve worked with all of these formats in the past and had pretty good success with each, but I’ve probably relied mostly on #1 and #3. For whatever reason, I’ve just found that these seem to convert really well (assuming I’m working with a great list to begin with). For most of my postcard campaigns, I haven’t bothered inserting their personal names – and the response rate has still been great… so while it could make a difference, I can’t say with any confidence how much of a difference it has made, because I usually don’t get this specific in my postcards. As for the signature, if I include something more than just the text of my name, I’ll insert an image of my signature like you mentioned. Hi Seth, yes definitely makes sense. Regarding the signature, I figure you haven’t seen a noticeable difference between using the text of your name vs an image of your signature? Not really, no (or if I did, I don’t know that I could tie it specifically to the signature). Would you please send me your postcards for finding tax delinquent sellers? Also, my web builder is preparing a form for my post card respondees to fill out. It has a password that will be included in my Click2Mail Post Card. How much info should I require on the form? I’m going to target just land without improvements, and limit the total land value from $10K to $50K. That way my investment in one property won’t be over $5k . Should I offer to buy the deed, or to buy the property? Last year I bought two properties for just the tax bill and sold them both for a total of $13K profit. My previous email asked for help in screening my spreadsheets. Still have not received a reply. Thanks. 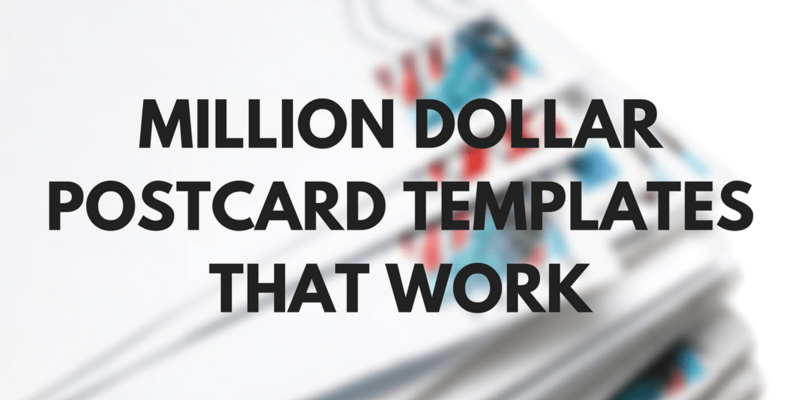 – I don’t give out these postcard templates for free. I’ve included several examples of what you can say above, but if you want the exact copy that I use, you can download my templates at the bottom of this blog post (again, see above). – You should include whatever information you want to know in order to make an educated offer on the property. Also, I wouldn’t bother with requiring your recipients to enter a password on your site – that will just give them more obstacles and will probably cause you to lose a lot of prospects. – Offering to “buy the deed” and “buy the property” is the exact same thing… so I’m not quite sure what you’re asking here. – I have not received any previous emails from you, but if you need some ideas on how to sort through your lists, you can find some insights in this blog post. Hey seth! question i only plan to acquire property at this current time VIA the “subject-to” method because my capital right now is so low, would these post cards be a good start especially for property that is going up for auction at a later date or that is in the per-foreclose stage? Hi Chris – those aren’t exactly the kinds of opportunities/properties I pursue with these postcards, but I think there are probably several parallels between what you’re trying to do, and what I’ve done with these. You may need to reword some of the language used in these templates… but I don’t think it would take a ton of work to do this – maybe just a few tweaks here and there. Ohh I see i appreciate the feedback before I purchase them I have not bought them yet. I was under the impression that these postcards would be perfect for a subject to type investment. Do you think using the direct mail postcard method is a good way to acquire subject to investments from home owners who are delinquent in their mortgage payments ? Good Information! We are new, so we’re like sponges trying to take it all in. Do the postcards we order have information you’ve put on them, we don’t need to do any creative thinking correct? Also, we want to market to those filing for divorce, do you suggest something for that area? I’m thinking about a letter instead of a postcard, something a little more personal. Any language you’d suggestion? Have any experience in this marketing group? Hi David – that’s correct. These are the exact postcards I’ve used for years. If you’re aiming for those filing for divorce, you may want to add an extra sentence to it to directly address that issue, but even that may not be necessary. The big idea is to help people understand that if they want cash for their property, you’ll make it very easy for them to sell… if they understand this message loud and clear, you should be alright. How do we get the cards printed and what is the best way to mail them out? Hi Winston – personally, I would recommend Click2Mail. It’s ultimately the fastest and most cost effective way to get those particular postcards out in the mail. You can find a pretty good tutorial on how to work with Click2Mail in this blog post. I just purchased the postcards but thought they would be more geared for the couples going through a divorce who are wanting to sell their house (after getting the list from the courthouse). The postcards were more geared in me buying their house. Could you please send the letters and postcards that you send with your wording in trying to get a listing from the couples going through a divorce . I was under the impression those were the postcards that I would receive. I would really appreciate that! Hi Debbie – I’ve actually never done a direct mail campaign with that specific purpose in mind… however, the postcards are worded to try and catch as many different potential “situations” as possible (I’ve gotten calls back from people in divorce situations before, so it can be useful in finding people in those situations). I’m sorry if it wasn’t what you were expecting! If you’d like a refund, let me know. What’s your goal with sending out the postcards Will? Are you trying to buy the properties for yourself, or do you have some other plan in mind? If you’re trying to buy them outright, I wouldn’t think it matters what your end use is… the goal is still the same, to offer an easy cash sale to the people to don’t want their land anymore, and (I assume) you can offer that solution to them. If your goal is to do something completely different, then yes, I would think they could be reworded to fit your purpose (whatever that is). Thanks for the reply, Seth. I connected with you on LinkedIn btw. My goal is to find land for the builder I work with who will then build custom homes on the property. Ideally we want 1 acre parcels, but will look at anything as I would like to eventually subdivide and do some small subdivisions. I have a post card that I have been using but I am working on tweaking it. I’ve incorporated some of the verbiage from your post cards. And yes, we can offer cash after the feasibility portion of the property is complete. That’s awesome William – I wish you all the best in finding those 1 acre parcels! I’m sure there are a lot of them out there to be had. Hi again. I’ve read numerous places and heard on podcasts that a good list is the delinquent tax list. I spoke with my county and they said it was basically illegal to give it out. Have you come across this? Any work arounds? Sorry, forgot to include a second question, which is do you use your real first and last name on the postcards? In my case I’m not sure I’m totally comfortable with it. How many times will you hit the same property owner with a card and what is the time intervals between each time you send it to them? Do you change the postcard each time you attempt to reach them again? Thanks! Hi Josh – when I’m using the delinquent tax list, I only hit them once. I may hit the same county again within about 6 – 12 months… but it’s not because I’m trying to hit the same people again, it’s because the list is filled with new motivated sellers. I realize not everyone takes this approach, but with delinquent tax owners… it’s a timing issue. If they don’t pay off their taxes OR sell fairly soon, they won’t be the owners of the property anymore. Just my take on it. Good question! That is great Seth, thank you. That does bring up another question. At what point in the tax lien foreclosure do you try to target the distressed owners? One of the counties I am targeting has a 3 year redemption period. Do you try to hit those distressed owners in the last year of their redemption period or would you target them at any point within the three years? Also, I was under the impression that the tax delinquency only changes once per year (given it is a multiple year redemption period) but your response indicated that new tax delinquent properties appear in 6 months. Is there a timeline that I am missing? I wanted to ask if you take monthly payments for mentoring? Your business model is very impressive and resonates with my style of thinking and skill sets. Your ability to convey strategies and tactics are impressive and I feel like we would get along well. Hi Josh – in the states where I’ve worked, I’ve usually had the best luck targeting people who are 2 years delinquent. The more delinquent they are, the higher motivation there will be… but it also means the taxes owing are much higher (and they usually include late fees on top of the amount they owe), and this can take a big bite out of your profit margin, and can end up killing many deals. For this reason, I’ve found it’s helpful to let some of their delinquent taxes add up, but not too much – and for me, 2 years has been the sweet spot (but I suppose this could vary in different areas around the country, based on how the late fees are calculated). Thanks Rashaun – I try! What’s your conversion rate? If 5% respond what percentage of those do you actually complete a deal with? Have you worked in California? Specifically Orange County? What are some things you suggest I do being a complete newbie to the industry? Hi John – I haven’t worked in Orange County, CA before, but I have worked in California and it’s a pretty good place to find deals. Are you looking at getting into the land investing business specifically, or some other niche of real estate? I just now heard your interview with Jake and Gino. It was really good! Can you please send the postcard you are using now? Thanks Jake! I’m glad you liked it. You can actually download the templates through the link above (and if you need a discount code, just sign up for the email list and you’ll get it sent to you automatically). I hope that helps! Hi Sammy – sorry about that! I’ll email it to you shortly. Hi Carlos – if you’re just looking for an example of what you could say – you can see it in the images above. If you’re looking for the actual, exact wording I use in my postcards, you can download those at the bottom of this blog post too (see above). Good luck! I bought your template package. Do you have a preference on which postcard to use? Do you decide based on the type of lead? Hi Joby, over time – I’ve probably used #1 more than anything. The simplicity of the messages is probably why it works so well, because it doesn’t appear phony or flashy, it’s just basic, authentic and to-the-point (which people rarely do these days). Most of the leads I’ve used these with have been delinquent tax property owners… and I can’t say this has had a major effect on which ones I’ve chosen. Hi Maurice – they’re available right at the bottom of this blog post (see above). Feel free to check them out! I appreciate your post! Quick question about postcard #1 – what do you put on the other side? Do you put your return address? Or, do you just put the stamp and address? If you do put your return address, is it just your personal information, or a business name? Hi Rich – that’s a good question. I do include my return address on the other side, but it’s NOT my personal information. I have a business name and a business mailing address (a rented PO Box through Pakmail), so the recipients won’t have any way of tracking down where I live. I just now paid $67 for the Postcard Package; but the download message also offered to let me save my card info for future purchases. I did, but when I clicked “SUBMIT”, I lost my download page. Please send me the download. Hi James – so sorry about that! I just sent you an email with the information you need. If you need anything else, let me know! Hey Seth, I signed up for the email list but don’t see the $20 off for the postcard package I’d like to purchase? Would you be able to send/resend the code? Sorry about that Dave. I’ll get this info sent over to you shortly. how do i order the post card package, are they customiazable ? Hi Marco – you can order it by clicking the “Add to Cart” button at the bottom of this blog post (see above). And yes, they come as a fully editable word document, so you can start by seeing how I word them and then change them however you want before sending them out. Hi Seth, thanks for the info…would it be possible to get your postcard sample? Love the content you’re providing! Showing value the right way! I have a question in regards to the postcards. Would you recommend writing the postcards by hand or just use your template and have them printed and mailed out? I also subscribed to your email list. Will the discount code come shortly after signing up? Hi TJ – thanks! I would definitely not recommend writing out each postcard by hand, the returns you’ll get on this kind of thing just aren’t worth it (not to mention, there are plenty of good handwriting fonts you can work with if that’s really important to you). And yes, you should’ve gotten the discount code immediately after signing up. If the email never came through (sometimes these get stuck in various spam filters), shoot me an email at seth@retipster.com and I’ll make sure you get it. Thanks!